After becoming only the second first-year head coach to lead a team to the BCS national title game, Auburn coach Gus Malzahn was reportedly named the Home Depot Coach of the Year on Wednesday. He will receive the award during ESPN’s college football awards show on Thursday. 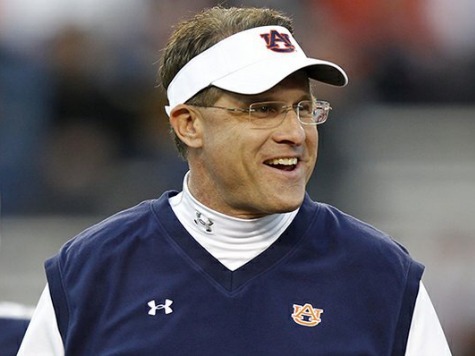 Malzahn, who was the offensive coordinator in 2010 when Auburn won a national title with quarterback Cam Newton, led Auburn to a 12-1 record this year and the SEC title a year after the program won no SEC conference game. Two of those wins–against Georgia and Alabama on the Plains–had arguably the two best finishes in the history of college football. Auburn will face Florida State in the national title game next month.